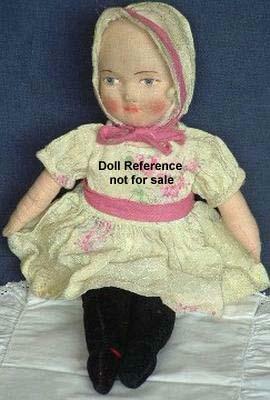 Chad Valley began producing cloth dolls around 1917. Earliest dolls have stockinet faces, later they hand painted felt faces with a velvet or velveteen body. 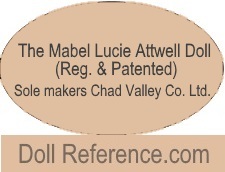 The Mabel Lucie Attwell Doll (Reg. & Patented) Sole Makers Chad Valley Co. LTD.
Also, Chad Valley Hygienic Toys Made in England Seal of Purity hangtag; the celluloid button; Chad Valley British Hygienic Toys or Royals; HRH . . . British made Doll By Permission of Her Majesty The Queen Sole Makers The Chad Valley Co Ltd. Harbonne, England. In 1923 Chad registered cloth printed aerolite rag dolls; Peggy, Peter Pan, Pixie, Sonia & Red Cloud..